After research and inspection, and new info, I have concluded that the Z70 should not be a unique gun, but is a simple caliber change to the Z-62, and the Z70/B is a fairly minor change in features. So, they are merged over there. This page will be wiped out and left as a redirect only, soonish. 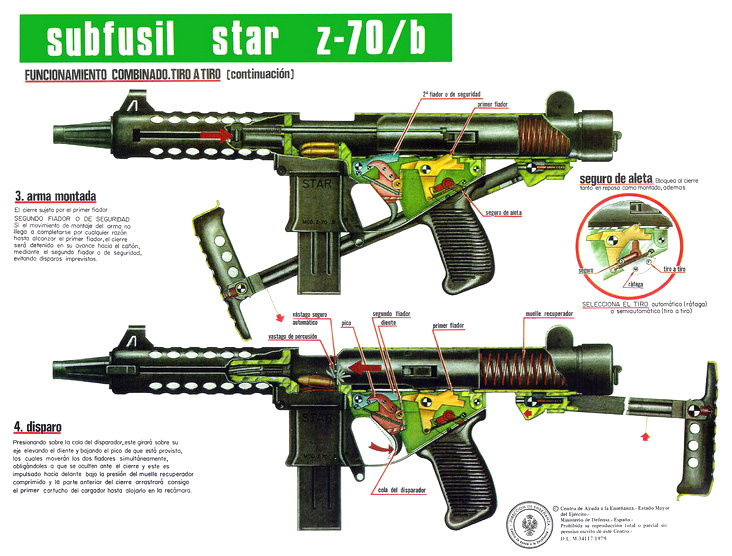 The Z-70s are basically product improved versions of the Z-62/63 SMG. There are no serious changes to the overall layout or method of construction and the guns are the same size and weight. The 40 round magazine was apparently discontinued for this weapon. The Z-62 and Z-70/B are still in use with second-line troops of all sorts, across Spain. It is especially commonly seen in use by the Navy, by shipboard protection forces, as those seen below. I will note that the finish of these guns seems to be perhaps the best ever made. 30-40 year old guns, expecially those in service aboard ships, should not be in such good condition. Spanish Marines have all upgraded to the Z-84, or use .223 carbines instead.